Ah yes, Alpe d’Huez… What could I possibly add to the many, many pages dedicated to this particular climb, one that’s on the bucket list of nearly every cyclist who dares to venture into the Alps? On 6 more occasions, the yellow jersey switched shoulders after the stage, but the TDF was eventually won by another rider. Only Greg Lemond and Stephen Roche were able to turn the table again: after losing the yellow on the Alpe, they eventually still won the GC. Despite it’s fame, it’s not even one of the hardest climbs in the area and it’s not particularly beautiful. Don’t get me wrong: it’s a tough climb and it offers some beautiful views, but looking at other climbs nearby, I would give a higher rating to the Croix de Fer and La Bérarde. 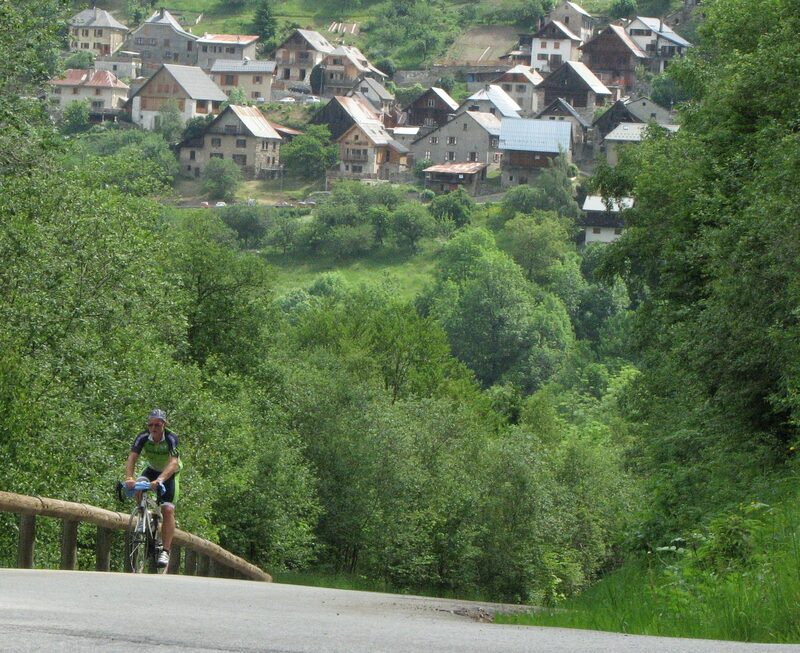 Of course, from a Dutch point of view, the Alpe is special. After all, there were 8 stage winners from ‘les Pays-Bas’, which – at the time of the last win – was more than half of the stages that included the Alpe. However, there is probably nothing like the Dutch taking over the entire Alpe during the fundraiser event called ‘Alpe d’HuZes‘, when it becomes the epitome of their fight against cancer. You can read more on that on my ‘Alpe d’HuZes‘ page, but during the year of our Team AD6 Tweets’ participation, I climbed the Alpe nine times in total within less than a month, eight of which within a week, so I have come to know it quite well. Or, at least the classic route of it – I also once rode the very nice ‘Villard-Reculas’ version, but never the ‘Col de Sarenne’, which basically is the approach from the (south-)east and I’m not covering that on this page. Since June 2011, there’s a Bend 0 sign on Alpe d’Huez, which is located in the final hairpin after entering Alpe d’Huez and going through the tunnel. 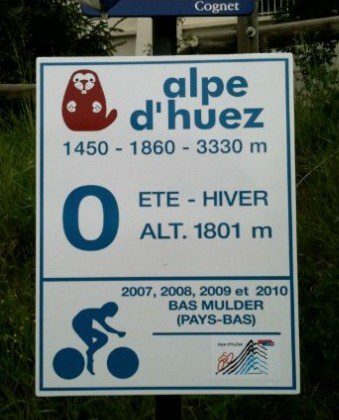 It’s named after Bas Mulder from Harderwijk, who died of lymphoma in September 2010 and who was one of the inspiring icons of Alpe d’HuZes. Filmmakers Ariane Greep and Bas Steman followed him during the last four years of his life and made the documentary Alpe d’HuZes: The Final Bend. From Bourg-d’Oisans, this climb is 13.8 kilometers long, navigating 21 hairpin bends along the way and this is the route the TDF takes. Each of the hairpins is labeled and named after a former stage winner. As there have been more stage winners than there are bends, they started adding names from the bottom (#21) up again, so a couple of signs have two names on them. The ‘official’ start is at the camping La Cascade – from that point, the climb is 13.4 kilometers, with an elevation gain of 1,129 meters. Perhaps you’re not easily scared by that 8.4% average, but if you base your effort on it and perhaps start out a little overconfident during the first two kilometers, you’ll be regretting it and cursing at yourself later. While the first couple of kilometers, with an average of over 10%, are listed as the toughest, there are several equally tough stretches later on. These include both stretches before entering La Garde and Huez, and the part between bends 3 and 2. All (but one) hairpins are relatively flat if you ride the outside curve, so you could use that to your advantage. This may well contribute to the reason why the overall average of this climb is what it is – moderately hard – because most stretches in between are over 9%. And remember, there probably are professional photographers along the route to capture your effort. These are typically stationed in the upper hairpins, like number 5 (sometimes) and number 2 (nearly always). Video from the Col Collective here. This is a more quiet and therefor very enjoyable alternative. It lacks the attraction of the classic route, but it offers a splendid view on (part of) that, once you have passed Villard-Reculas, as seen in the picture of Bend 7 above. 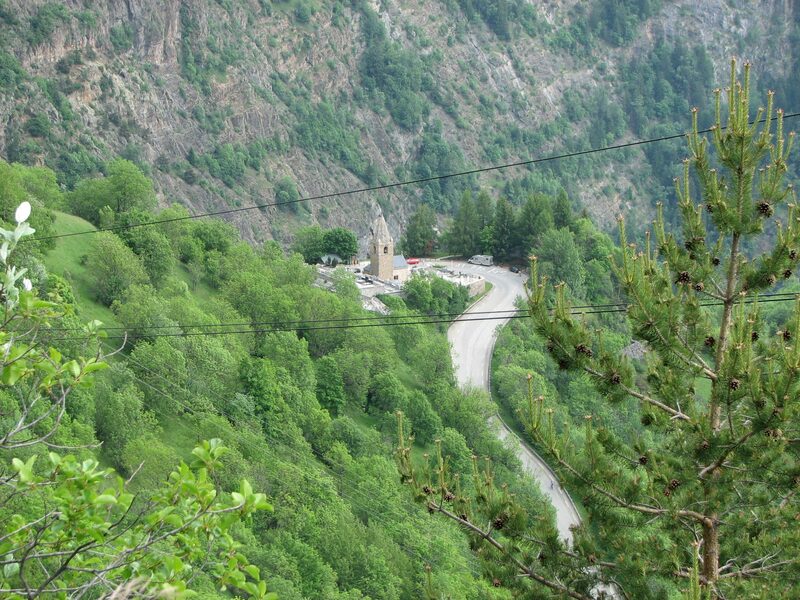 The start of this climb is in Rochetaillée, more commonly known as starting point for the climb up the Croix de Fer/Glandon. Shortly after traversing the river La Romanche, you turn right (D44) and follow the direction ‘Villard-Reculas’. From there, the climb is 20.5 kilometers long, with 1,130 altimeters (5.5%) but that’s a little ‘deceiving’. 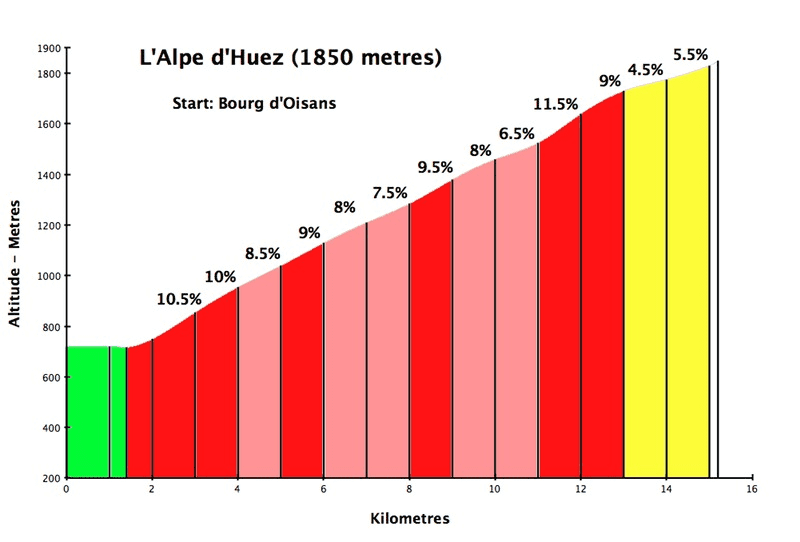 You can see on the profile card that there’s a near flat stretch traversing the valley between Villard-Reculas and Huez and even a short descend into Huez.